Happy Thursday! Well, summer break is off to a great start! Yesterday, I had a PTO meeting in the morning and then we spent the rest of the afternoon finding summertime fun. We had a Chick-Fil-A picnic, explored the zoo, and then cooled off at the splash pad. My girls had so much fun and so did I... but goodness gracious, it was a hot day in North Carolina! 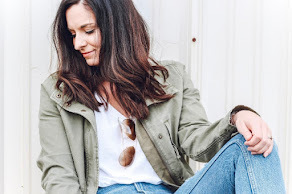 Today, I'm sharing what I wore to church this past Sunday and honestly, these pants were way out of my comfort zone. I found them at Marshalls (only $17) last Friday and I was definitely a little worried that I would look like I belonged in the Aladdin movie. But I loved the way they looked and decided to buy them anyway! Sometimes the pieces that make us the most nervous end up being the most fun. The slits on each side of the pants go all of the way up so I did safety pin them to avoid a major wardrobe malfunction. The next time I wear them, I plan to wear black shorts underneath or wear them over swimsuit as a fun cover up. They are definitely coming to the beach with me! 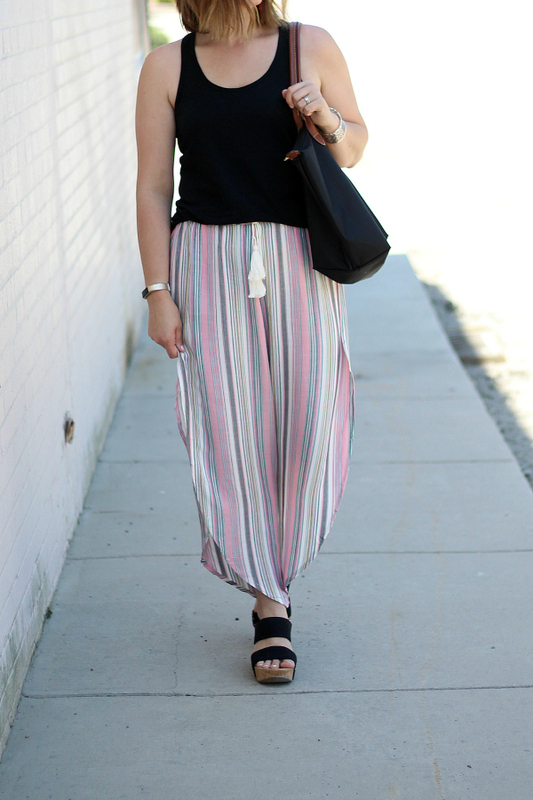 I styled these pants (similar pants here) with a simple loose fitting black tank ($8! ), statement earrings, my most comfortable wedges, a cuff bracelet, and a black tote for a super comfortable look. You look great in those pants! I think you styled them perfectly! 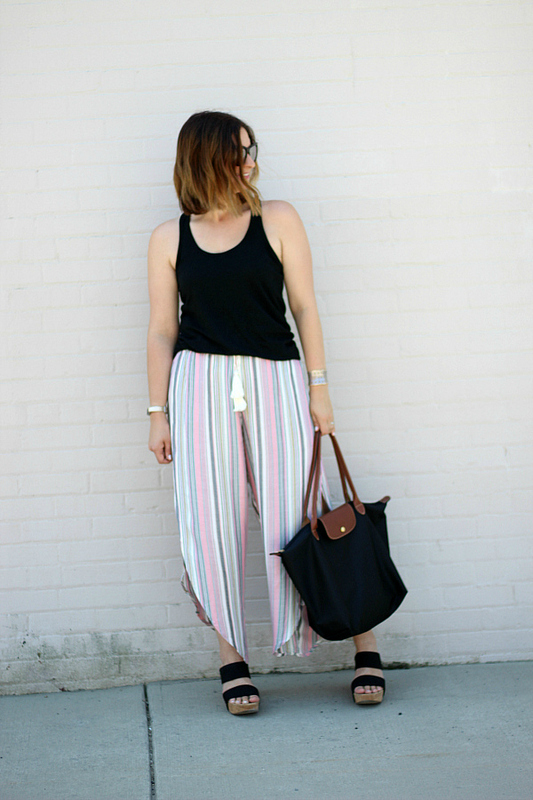 Super cute pants and they look so comfortable! I'm beyond obsessed with those pants! So glad you tried something different. You look fabulous! 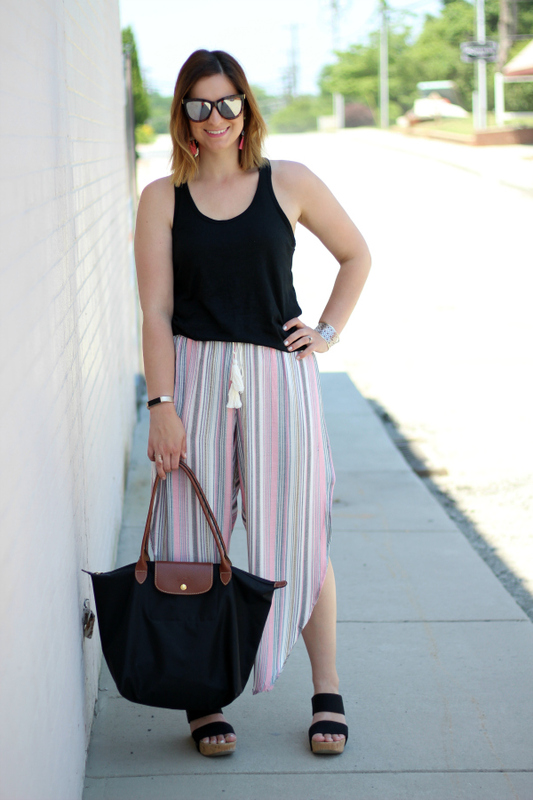 prettiest summer pants I've seen! I bet it's hella comfy!